Morse code blinker. Original by Antoine R. Dumont, modified to simplify and fit into the existing examples structure. A dit or a dah is all we need for Morse: A dit is a dot; and a dah is a dash in the Morsian world. We use LBreak and WBreak to indicate a letter and a word break so we can insert some delay between letters and words as we transmit. Given a sentence, decode it. We simply drop any letters that we do not have a mapping for. Given a morsified sentence, compute the delay times. A Left value means turn the led on that long, a Right value means turn it off that long. A simple demo driver. 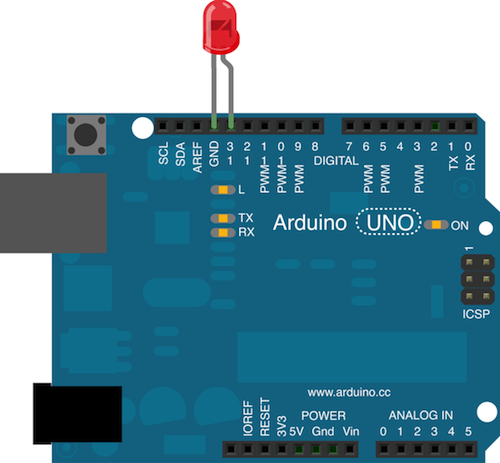 To run this example, you only need the Arduino connected to your computer, no other hardware is needed. We use the internal led on pin 13. Of course, you can attach a led to pin 13 as well, for artistic effect.